What Holds Companies Back and How to Fight It? In a survey conducted by PwC, 81 percent of CEOs agree that mobile technologies are strategically important for their business. This clearly indicates the global trend for adopting a mobile-first strategy. However, talking about mobile, most business owners tend to focus predominantly on customer-facing solutions. Enterprise mobility, the way mobile technologies can be used to improve employee productivity and automate the internal business processes, is often overlooked by decision-makers. Yet, as the recent survey by Apperian shows, IT decision-makers have finally come to understand the value of enterprise mobility. Eighty-seven percent of them think it is critical for their company’s profitability. 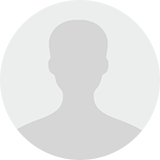 Why is enterprise mobility so important? What are some examples of successful employee-facing solutions built by major brands? In this article, we will focus on the benefits of enterprise mobility in the travel sector. Travel tech is one of the industries that have been quick to adopt a mobile-first outlook. Targeting increasingly mobile consumers, industry leaders have been investing in robust consumer-facing mobile experiences for years. There are many digital transformation success stories in the travel domain. From travel booking to mobile check-ins and in-flight entertainment, the solutions deployed by OTAs, travel providers, airports, and travel management companies support every stage of the customer lifecycle. But, what about the employees? Travel industry workers are often working off site, be it a pilot, a flight attendant, an airport worker, or a corporate travel manager who needs to be accessible 24/7. Having no access to a desktop most of the time, they still need to perform a number of tasks that would be much easier when aided by a computer. Thus, travel companies turn to mobile solutions as a way to solve a number of operational issues. According to the recent Adobe survey, over 50 percent of the respondents cite the need for instant communication and an increasing mobile workforce as the key driving influences to foster the adoption of enterprise mobility. Due to the specifics of their operations, airlines were among the first to adopt employee-facing mobile solutions. Namely, electronic flight bags (EFBs) – information management devices used by flight crews for easy and paperless flight management – have become must-haves in modern aviation. For example, Ryanair, the popular European low-cost carrier, was able to increase in-flight accuracy and improve overall aircraft efficiency by replacing traditional paper manuals (typically about 33-44 lbs. each) with iPads as a part of their digital transformation strategy. As a result of the above-listed benefits, the average ROI when investing in enterprise mobile solutions equals 35%, according to the Adobe research quoted earlier. In addition to that, employee-facing mobile solutions have a positive impact on the quality and efficiency of customer service. United has recently partnered with IBM and Apple to implement a mobile solution for front-line employees. The company’s goal is to increase the capabilities of their app that runs on 50,000 Apple devices used by flight attendants and gate agents to offer improved customer service. Talking about enterprise mobility in the travel domain, there are already several examples of companies successfully deploying employee-facing mobile solutions. Let’s take a closer look at those success stories. Delta Airlines, one of the major American carriers, was recently involved in an unpleasant situation. After being forced to cancel over 3,000 flights in April because of severe weather conditions, the company experienced a major internal outage. In addition to the natural disaster, the airline staff reported some critical problems with the company’s scheduling and employee roll-call systems. The situation was unprecedented. Thousands of employees scattered across the US unable to reach management, and the company had to cancel more flights simply because of the lack of crew members. What’s even more unsettling, is the fact that a mission critical task like employee communication is still handled by old-fashioned roll-call systems. If you think about it, a single mobile app could make a difference in this situation. Providing real-time scheduling information and a reliable, convenient corporate communication channel could help the company avoid significant losses and more safely navigate the dangers posed by natural disasters. So, mobile solutions in travel prove to be valuable in a number of aspects. Some of the use cases of enterprise mobility are exemplified by the following companies. According to the Airline IT Trends Survey conducted by SITA, 55 percent of airline personnel were using smartphones for work in 2015, with the number expected to grow to 73 percent by 2018. Alaska Airlines was among the pioneers in the enterprise mobility strategy adoption. In 2011, the carrier was the first to replace its pilots’s paper manuals with iPad-based EFBs. One of the major US air carriers, Alaska Airlines is successfully deploying its enterprise mobile apps across more than 10,000 corporate devices operated by front-line employees. Moreover, 40 percent of company staff are using their own devices at work as part of the company BYOD (bring-your-own-device) policy. While using traditional distribution channels, such as App Store or Google Play Store, for internal apps is not an option due to related security issues, private enterprise app stores are commonly used within the organizations. And Alaska Airlines is no exception. Its internal app directory employs strong authentication methods and allows users to see and install only the apps they require (and are allowed to use) in their work. With a huge number of internal processes that must be in sync with each other as well as with the airlines, airport staff has a growing need for mobile. Thus, many air hubs worldwide are investing in enterprise mobility solutions. Dallas/Fort Worth International Airport since 2013 has launched over 40 mobile apps targeting both passengers and employees. As a result, over 43,000 functions and processes that have always been handled manually now are completely digitized. These mobile apps also make it easier for airport employees to communicate with each other and respond to issues in real time. For example, the airport asset management solution allows a worker who notices any minor issue, such as a burned-out light bulb in the restroom, to create a ticket directly in the app and have a technician fix it immediately. The same applies to more significant issues. For example regarding airfield inspections, an employee can document the identified problems and create reports right on the spot instead of heading back to the computer with the hand-written notes. Amsterdam Airport Schiphol in the meantime migrated its workforce to BYOD completely. After a short trial, the airport saw a 50 percent adoption trend. Because of the resulting 80 percent reduction in environmentally harmful printouts, costs have been reduced and efficiency increased. Yet, the main advance for Amsterdam Airport as one of the global transfer hubs was the deployment of a smart luggage tracking system together with IBM. The solution allows airport employees to keep track of each and every luggage item at every point of its journey through the airport. The system automatically chooses the shortest way for an item to get the destination point. As a result, the airport expects to grow its capacity by 40 percent, from 50 to 70 million bags per year. With 679 properties in 54 countries, Hyatt Hotels is one of the world’s top hospitality providers. After moving its infrastructure to the cloud, the company decided to pursue mobile initiatives in the sphere of employee training. The mobile app replacing 2,500 paper manuals went live in 2015. Targeting the company’s 100,000 employees across 54 companies, the solution provides easy access to videos, PDF documents, and online sources. Short training videos have no voiceover; they provide visual guidance for the employees on how to perform different tasks eliminating the language barrier. Regardless of country or language, all Hyatt employees can use video training resources equally. The solution also provides machine learning capabilities. The so-called Intelligent Mentor becomes smarter and offers more accurate recommendations as users engage with the system. It provides tailored suggestions on skills to develop, courses to take, resources to read, based on the user’s activity to improve his/her productivity and quality of work. Additionally, the system supports reporting and analytics capabilities so managers can see the results for every employee and get valuable insights about the content itself (the preferred user language, number of views). While the cloud-based training solution was initially deployed as a desktop product, the use of the application’s mobile version recently grew by over 100 percent per quarter. Thus, the company saw the demand for employee-facing mobile products and will further pursue this strategy. Miami-based premium cruise line, Celebrity Cruises, has a forward-thinking strategy. By providing their sales representatives with an iPad-based mobile app, the company allows them to target over 2,000 guests per ship with new offers. Considering high conversion while onboard, the company wanted to further increase its reach and make the overall booking process easier and more efficient for both the sales reps and the guests. The Future Cruise Sales app enables the employees to showcase available offers and conduct interactive vacation planning sessions in the field. Thus, the app is completely autonomous and works offline as there is typically lack of reliable Internet access in the middle of an ocean. All the information and multimedia assets come preloaded, while the in-app booking forms can store customer data locally and sync it with the server as soon as connection is established. Providing all necessary information about every possible destination or offer type with photos and videos and rich booking forms, the app serves as a powerful and extremely efficient sales tool. It helps sales reps reduce booking time by 40 percent, enhances customer experience through personalization, and facilitates lead generation and sales. 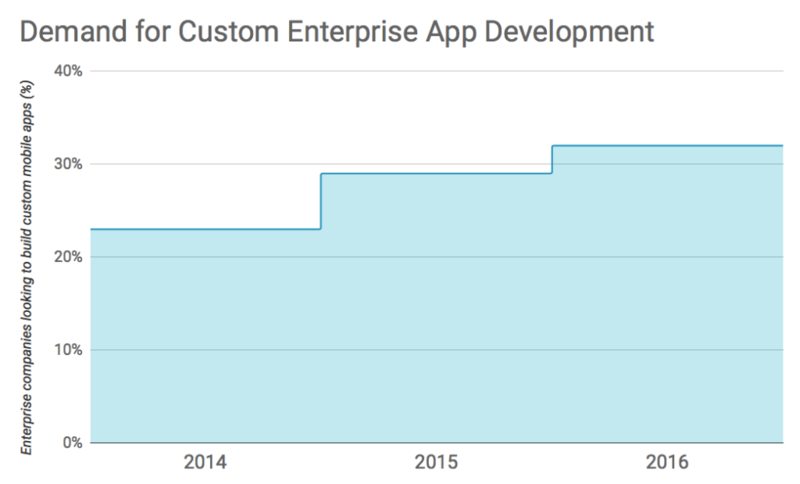 Over the last couple of years, the enterprise demand for custom mobile app development has grown from 23 percent in 2014 to 32 percent in 2016. Prioritizing staff. Employees are often not considered a priority by companies. The brands invest in something that will bring measurable profit, i.e. customer-facing solutions. Thus, the lack of immediate and tangible ROI is holding enterprise mobility back. High initial investment. Employee-facing apps require advanced integration with the core business systems and processes, which is often restricted by outdated solutions. As a result, the companies must first focus on legacy system modernization, which can be a time-consuming and costly process. Compliance issues. Largely due to the integration problems mentioned above as well as governmental and legal industry regulations, compliance remains one of the main roadblocks for enterprise mobility in travel. Security. The fear of not being able to prevent data leaks and cyberattacks cripples the enterprise mobility efforts at many companies. 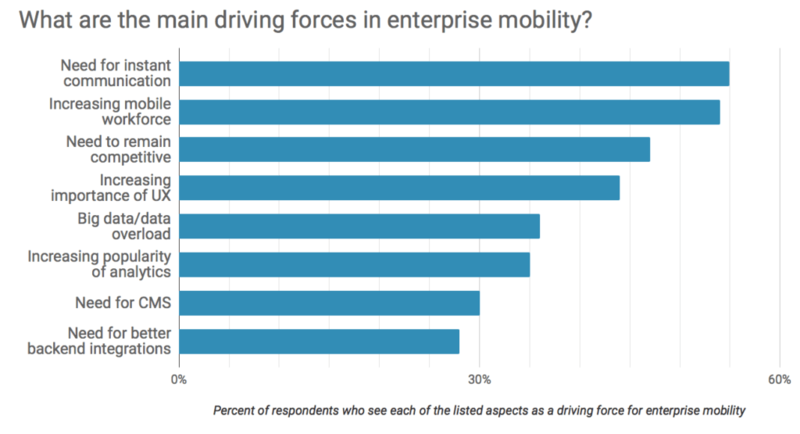 Yet, the primary barrier in this regard is the lack of strategy for mobile adoption within the enterprise. 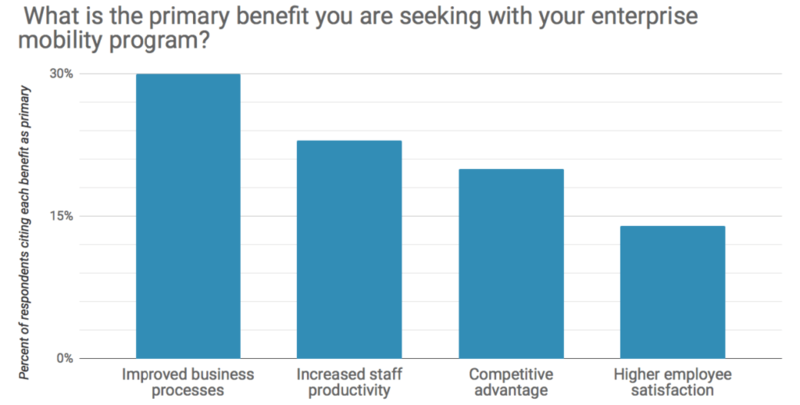 If you are considering the move to mobile workforce as a strategic benefit, the success stories and examples listed above can serve as an inspiration. But most importantly, you can turn to the primary audience you will target with your mobile solutions – your employees. Sourcing ideas for your next enterprise mobile initiative with the people who will be using it is a great place to start. Of course, you can hire a professional technology consulting company to guide you through all stages of this challenging process.